You are here: Home > United States > Colorado > Colorado Springs > Art Galleries > Cheers! Drink up! Description Cheers! Drink up! 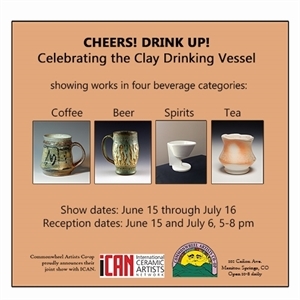 Celebrating the Clay Drinking Vessel is a juried collaborative show between the International Ceramic Artists Network (ICAN) and the Commonwheel Artists Co-op in Manitou Springs, Colorado. Cash awards for "Best of" will be given in each of the following four categories: Beer, Coffee, Tea and Spirits, as well as Honorable Mention awards. We are also hosting Purchase Awards by local beverage businesses including Red Dog Coffee, Manitou Brewing Company, The British Pantry, Mate Factor, and Swirl Wine Bar. Add Cheers! Drink up! to your free online travel itinerary. Directions to Cheers! Drink up! Directions FROM Cheers! Drink up! Places to stay near Cheers! Drink up! Things to do near Cheers! Drink up! Be the first to review Cheers! Drink up!